The zinc bond formerly owned by Guyana Stores. 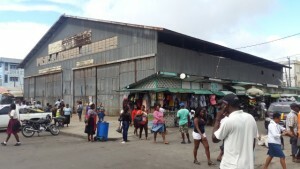 A group of vendors, who normally sell outside the old Guyana Stores Limited (GSL) bond on Water Street, have now been left out in the cold as the businessman plans to tell the High Court that he never granted them permission to play their trade, but instead they had long obstructed him from using the plot of land. An interim High Court injunction secured by a vendor outside the zinc bond on the basis that they had been granted permission by Malcolm Panday to sell there until he was ready to use the building now appears in jeopardy because he plans to officially deny doing so. “Panday has denied these claims and will be signing off on an affidavit that will be presented to the court next week debunking his involvement in facilitating vending at his GSL bond,” the City Council said in a statement. Efforts to contact Panday for a comment were unsuccessful. In discourse with the Council, City Hall said Panday explained that the GSL zinc bond was acquired from the National Industrial and Commercial Investments Limited (NICIL) many years ago. He said plans were drawn and approval was granted from the Central Housing and Planning Authority and the City Engineer’s office for an eight story mall to be constructed. However, Panday said vendors have occupied all four sides of the zinc structure making it extremely hard to start construction. As it stands, vendors have not only occupied part of Panday’s property, but they have taken up some of the city pavement. Panday’s place is laid out at 109ft four inches wide and 127ft six inches long. At least 90 percent of its perimeter has been occupied by vendors who have not only placed tables and other such items on the pavement but have built structures that remain after business hours. City Hall said vendors have been asked on different occasions to remove from the GSL location, but have not heeded those warnings. Despite advice by lawyers to commence construction regardless of their adherence to his notices, Panday said he has always been “sympathetic,” since he is aware that persons live at their place of business; some of them along with their children. “Starting construction would be dangerous to those persons,” Panday emphasized. He related, however, that being unable to construct the mall has caused him on several occasions to have authorities extend his construction authorization. The most recent extension was granted last November for one year, and according to the document, should Panday fail to commence construction this year, no more extensions will be granted on the property. “So it’s like I’m being penalized for this disorganization,” the businessman opined. He stated that should the mall be constructed, it would provide jobs for hundreds of persons, this is during its construction stage and its later operation stage.